During the Adair County High School Academic Team’s string of consecutive district titles, three different men have served as U.S. president. When the run started, the iPhone had yet to be invented and no one had ever heard of an “app.” The continued dominance entered its second decade last weekend when the squad captured its 11th straight Governor’s Cup District crown at Russell County High School. Adair County beat out its three competitors – Casey County, Green County, and Russell County high schools – to continue a streak that started before the youngest team members were even in elementary school. All individual medalists qualify for Region, along with the Quick Recall and Future Problem Solving (FPS) team. Quick Recall swept every round of competition Saturday, and FPS earned unanimous first place marks from judges. FPS members are Ben Hancock, Brandon Harp, Lejano Zavilija, and Arabella Caldwell. Individually, Brandon Harp (math), Ben Hancock (science), Maddie Harmon (language arts and arts & humanities), and Dylan Pendleton (social studies) all earned first place finishes. Other individuals with impressive finishes included: Keaton Coomer (second place in math), Jaiden Taylor (second place in science), Samuel Willis (fifth place in science and second place in language arts), Chris Stuchell (fourth place in language arts and arts & humanities), Trevor Smith (second place in arts & humanities and fifth place in social studies), Wes Stone (third place in composition), and Christina White (fourth place in composition). 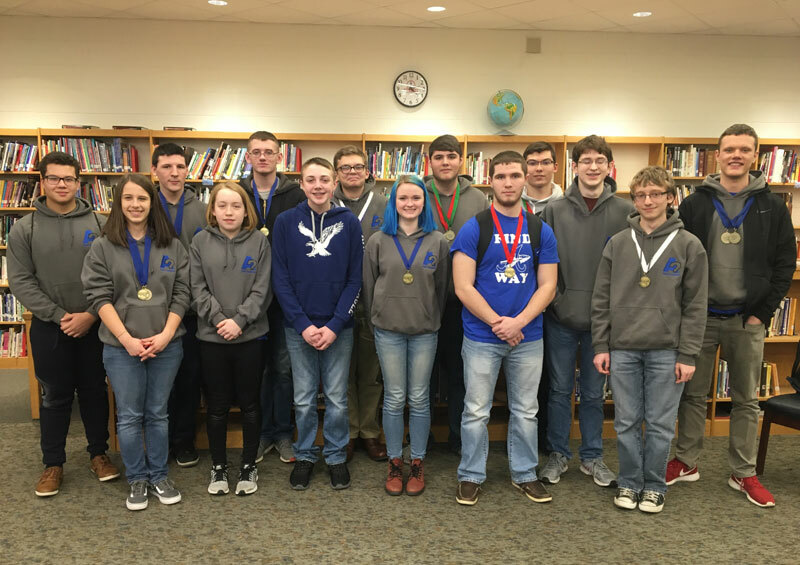 Members of the 2017 District Champion ACHS Academic Team are, from left: Brandon Roberts, Maddie Harmon, Brandon Harp, Elizabeth Rexroat, Dylan Pendleton, Ty Cheatham, Chris Stuchell, Arabella Caldwell, Trevor Smith, Jaiden Taylor, Samuel Willis, Alex Godsey, Keaton Coomer, and Ben Hancock. Not pictured: Christina White, Lejano Zavalija and Wes Stone.